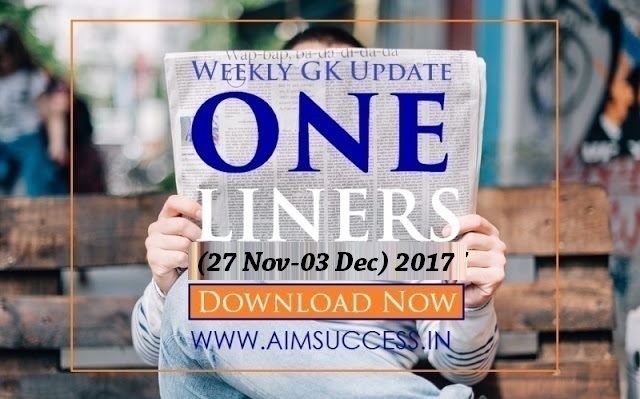 Weekly Current Affairs One Liners (27 Nov - 03 Dec) 2017: Download Now - The one liner of the week is a recap of the important happenings that occurred between 27th November - 03rd December 2017. The important happenings of the week covered in this segment include 5th Bi-monthly Monetary Policy Review by RBI, Jerusalem and International Solar Alliance among others. 'Paytm Payments Bank' was formally launched at the hands of the Union Finance Minister Arun Jaitley. Now, the number of Payments Bank in India goes to four, the other three operational are Airtel Payments Bank, India Post Payments Bank and Fino Payments Bank. The first ever ‘One Rupee Note’ completes 100 years of its inception on Nov 30, 2017. The first Re1 note printed in England was issued on Nov 30, 1917 in India, with an image of King George V, the then British monarch, imprinted on the left corner. The index of eight core industries, comprising of coal, crude oil, natural gas, refinery products, steel, fertilizers, cement, and electricity, released by Ministry of Commerce and Industry according to which Core sector growth has grown 4.7% in Oct 2017. The Union Govt fixed 2,952 rupees per gram as the price of new series of sovereign gold bonds (SGBs). Indian online payments company BillDesk has launched cryptocurrency exchange Coinome in India which allows for the trading of Bitcoin and Bitcoin Cash. Multi-lateral funding agency Asian Development Bank (ADB) increased annual funding to India to up to $4 billion from existing $2.7 billion from next year to accelerate inclusive economic transformation. The Union Govt has constituted 15th Finance Commission under the chairmanship of NK Singh which will make recommendations for the five years commencing 1 April 2020 till 31 March 2025. 7th edition of International Storytellers Festival, Kathakar was inaugurated by Minister of State (MoS) for Home Affairs Kiren Rijiju at Indira Gandhi National Centre for Arts (IGNCA), New Delhi. The 22nd meeting of Board of Mangement (BOM) of Small Farmers’ Agri-Business Consortium (SFAC), chaired by Union Agriculture and Farmers Welfare Minister Radha Mohan Singh, held in New Delhi. India has been re-elected to Council of the International Maritime Organisation (IMO) at an assembly of body at its headquarters in London. India awarded certificate of commendation for its exemplary enforcement action to combat illegal wildlife trade by Convention on International Trade in Endangered Species of Wild Fauna and Flora (CITES). The Telecom Regulatory Authority of India (TRAI) has upheld the basic principles of an open and free internet in its recommendations on net neutrality. World's first Sanskrit 3D film 'Anurakthi', directed by Asokan PK, was screened at the International Film Festival of India in Panaji in Goa. Prime Minister Narendra Modi and US President Donald Trump’s advisor and daughter Ivanka Trump jointly inaugurated 8th Annual Global Entrepreneurship Summit (GES 2017) in Hyderabad, Telangana with the theme “Women First, Prosperity or All”. The Union Ministry of Health and Family Welfare (MoHFW) and Indian Council of Medical Research (ICMR) launched India Hypertension Management Initiative (IHMI), which aims to reduce disability and death related to cardiovascular disease (CVD), the leading cause of death in India. The Union Power Ministry launched Pradhan Mantri Sahaj Bijli Har Ghar Yojana (SAUBHAGYA) in Manipur. India will assist Mauritius to develop and set up digital locker services as Mauritius showing keen interest in India’s DigiLocker service. The decision was taken on the sidelines of Global Conference on Cyber Space 2017 which was held in New Delhi. The Telangana Govt is going to set up the world’s first Information and Technology (IT) Campus for differently-abled persons (divyangs) in state capital Hyderabad. Andhra Pradesh Assembly has unanimously passed Kapu Reservation Bill, 2017 to provide 5% quota in education and employment. The XIth Annual MedTech Summit of Biodesign Programme, aims to train next generation of medical technology innovators in country, was held in New Delhi. (INSPIRE 2017) was held in Jaipur, Rajasthan. The Union Ministry of Women and Child Development (WCD) launched intensive training program for Elected Women Representatives (EWRs) of Panchayati RajInstitutions (PRIs) and Master Trainers in New Delhi. Govt has launched Noxeno, a nasal foreign body removal device developed by start-up InnAccel Technologies Private Limited, Bangalore. President Ram Nath Kovind inaugurated 18th edition of the Hornbill Festival, also called as the ‘Festival of Festivals’, at the Naga Heritage Village in Kisama, Nagaland. The Chhattisgarh govt has ordered a ban on bursting fire crackers in six of its cities, state capital Raipur, Bilaspur, Bhilai, Durg, Raigarh and Korba from Dec 1 to Jan 31. Odisha Chief Minister Naveen Patnaik unveiled the logo and mascot for the Hockey Men's World Cup 2018 at at Kalinga Stadium in Bhubaneswar. The iconic Trump Tower comprising 140 ultra-luxury apartments launched in Kolkata. Odisha govt launched a 'Fish Pond Yojana' scheme to boost fish production in the state with a budgetary provision of Rs 96 crore. The first phase of the Chabahar port was inaugurated by Iranian President Hassan Rouhani, opening up a new strategic transit route between Iran, India and Afghanistan, bypassing Pakistan. The word “populism” has been announced as the Cambridge Dictionary 2017 Word of the Year. South Korea and United States have launched Vigilant Ace, their largest-ever joint aerial drills. Raj Shah who holds a key position in the White House, gaggled with reporters on board US Presidential chopper Air Force One, becoming the first Indian-American to enjoy the privilege. The first meeting of Working Group of BIMSTEC (Bay of Bengal Initiative for Multi-Sectoral Technical and Economic Cooperation) member countries discussed draft text of BIMSTEC Coastal Shipping Agreement in New Delhi. The High Level Inter-Governmental Mid-Point review meeting of Asia and Pacific Decade for Persons with Disabilities, 2013-2022 held in Beijing, China. The International Monetary Fund (IMF) has approved a new USD 88 billion credit line for Mexico, replacing the existing line. The Border Security Force (BSF), the biggest border guarding force in the world, celebrated its 52nd Anniversary of Raising Day on Dec 01. Pakistan’s Law Minister Zahid Hamid has tendered his resignation following the deadly clashes across the country between police and protesters belonging to hardline religious groups. The 7th international military games to be held in Wuhan city in the central China's Hubei Province, the defence ministry has announced. The third Combined Military exercise, ‘Ajeya Warrior- 2017’ between India and the UK held at Mahajan Field Firing Range near Bikaner of Rajasthan. The Indian Coast Guard (ICG) has conducted the Regional Level Marine Oil Pollution Response Exercise named ‘Clean Sea-2017’ at sea off Port Blair, Andaman & Nicobar Islands. Defence Acquisition Council (DAC) chaired by Defence Minister Nirmala Sitharaman has approved procurement of 260 Software Defined Radios (SDR), a naval communication sets for Indian Navy at cost of Rs. 490 crore to ramp up surveillance on the high seas. The Scientist from New Zealand, Nick Gerritsen has developed world’s first artificial intelligence politician named SAM. North Korea successfully launched Hwasong-15, a new type of nuclear-capable intercontinental ballistic missile (ICBM). (APAs) with Netherlands in November 2017. India and Singapore have signed the Bilateral Agreement for Navy Cooperation. The Union cabinet has approved Rs. 9,046 cr National Nutrition Mission (NNM) to address under-nutrition among children below the age group of three. India and Italy have signed Memorandum of Understanding (MoU) for enhanced cooperation in health sector. Jet Airways has deepened its partnership with Air France-KLM beyond codeshare to create a “metal-neutral” agreement between the three airlines. The Higher Education Funding Agency (HEFA) approved projects worth over Rs. 2,066 crore for six higher educational institutions to improve the research infrastructure and further their standing at global level. India and United Kingdom (UK) will be going to sign Memorandum of Understanding (MoU) in urban transport sector for cooperation in policy planning, technology transfer and institutional organisation. A tripartite MoU signed between Tourism and Hospitality Sector Skill Council (THSC) and National Skill Development Corporation (NSDC) with Airbnb, the world’s leading community-driven hospitality company. Russia agreed to assist India to set up National Crisis Management Centre (NCMC) in the country to handle disaster and other emergency situations. India and Greece signed Air Services Agreement (ASA) and MoU on Cooperation (MoC) in field of New and Renewable Energy. India and Russia have signed comprehensive anti-terror pact agreement for enhancing bilateral cooperation in tackling all forms of terrorism and countering threat posed by narcotics. Jenny Kim, a South Korean beauty pageant titleholder, has been crowned Miss Supranational 2017 in Krynica-Zdroj, Poland on December 1, 2017. South African Demi-Leigh Nel-Peters was crowned Miss Universe at pageant held at The AXIS at Planet Hollywood in Las Vegas, Nevada, United States. The Golden Temple, also known as Sri Harmandir Sahib (the abode of God), and the Darbar Sahib, the holiest Gurdwara (temple) and the most important pilgrimage site of Sikhism, in Amritsar, India, has been awarded the ‘most visited place of the world’ by ‘World Book of Records’ (WBR). The 48th International Film Festival of India (IFFI) was held in Panji in Goa. The third Indian Council for Cultural Relations (ICCR) Distinguished Indologist Award 2017 was awarded to Professor Hiroshi Marui of Japan. Indian archers produced an impressive performance, grabbed three gold, four silver and two bronze medals at the Asian Championships in Dhaka, Bangladesh. India’s Saikhom Mirabai Chanu won gold medal at World Weightlifting Championships held in Anaheim, United States. The Boxing Federation of India (BFI) was recognised as a national body by the Indian Olympic Association (IOA), which removed the terminated Indian Amateur Boxing Federation (IABF) as its affiliate after months of indecision. Valtteri Bottas won the season-ending Abu Dhabi Grand Prix from pole position, beating his Mercedes teammate Lewis Hamilton as Formula One’s season finale petered out into a procession. Gopi Thonakal created history by becoming first Indian man to win Asian Marathon Championship held at Dongguan in China.